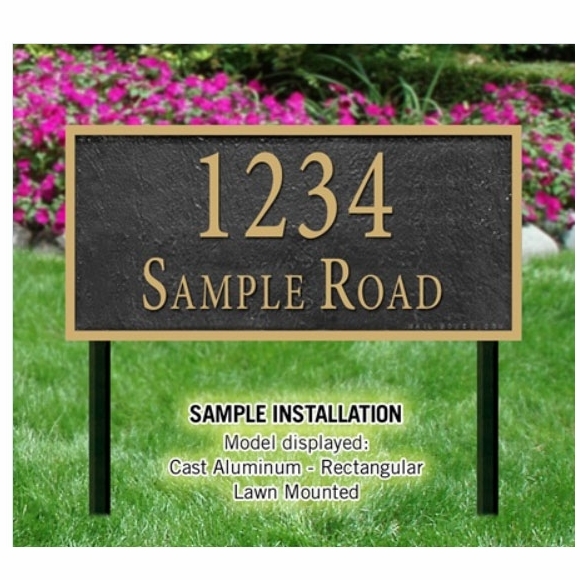 Lawn Mount Address Sign - - large cast aluminum address sign. Personalized with your one line or two line address or custom message (e.g. Private Property, No Parking, Keep Off The Grass). Three shapes: arched, oval, and rectangle. Made of 3/8" thick cast aluminum for residential and business locations. Each personalized plaque has raised gold or silver painted characters and trim. Available with either a one line or two line address or custom message. Each line can hold up to a total of 16 characters. Character size depends on the number of characters in the line. The first character of every line is approximately 20 percent larger than the other letters. If you are ordering a sign with a one-line address, please leave the Line 2 input box empty. Be sure to enter each line of text exactly the way you want it to appear on your sign. Please check and re-check your spelling! Includes two 1"W x 31.5"H black aluminum lawn stakes. Choose from twenty-six different color schemes: black/gold, brick red/gold, brick red/silver, black/silver, black/white, copper/antique copper, chocolate/gold, chocolate/silver, gray/silver, gray/white, hunter green/gold, hunter green/silver, navy/gold, navy/silver, sea blue/gold, sea blue/silver, sand/gold, tan/white, white/black, white/gold, white/silver, aged bronze/gold, swedish iron/silver, and swedish iron/black. Arched 21"W x 13"H x 3/8"; weighs 10 pounds. Oval 18"W x 10.5"H x 3/8"; weighs 10 pounds. Rectangle 21"W x 10"H x 3/8"; weighs 10 pounds. Please allow 2 to 3 weeks for production and delivery. Very pleased with the quality of the product. Loved all the options. Great service and speedy delivery. would recommend.